I tend to shy away from promoting our own project on the blog too much as I feel that this section is a great place to highlight the interesting work of others. Saying that, I knew if our readers liked our blog they also might be interested in subscribing to our updated newsletter format that we’ve been producing over the last few weeks. The idea of this updated newsletter is to offer a collection of craft and design handpicked from around the web straight to your inbox. When searching for content I often find myself coming across many sources of inspiration, some of which aren’t able to make it up here on the website. 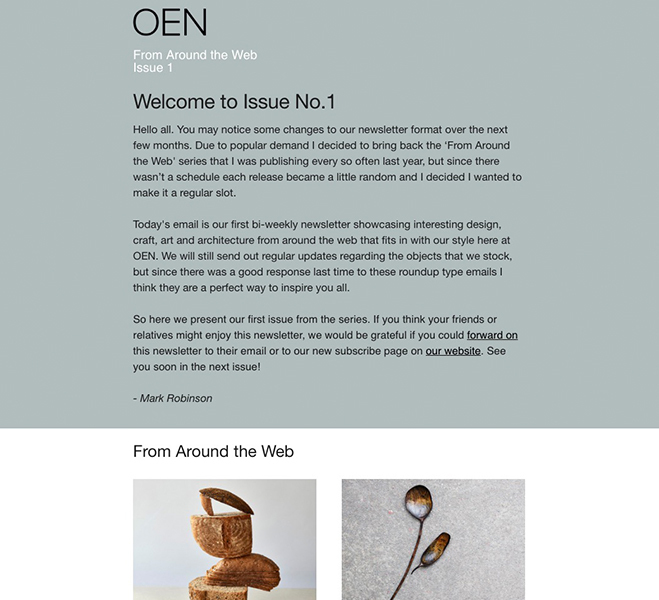 So this newsletter format gives us the chance to place these somewhere and hopefully inspire all of you with this unique content “from around the web”. Some of you might already be subscribed, so there’s no need to worry, you will receive these emails from now on. For everyone else please click on over to the newsletter page where you can subscribe and become part of our tight knit group. We hope to see you soon in your inbox!